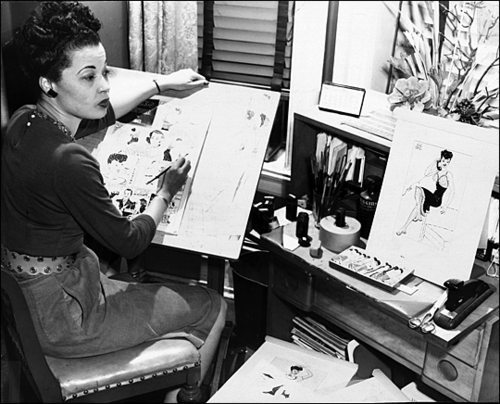 Jackie Ormes at her drawing table. 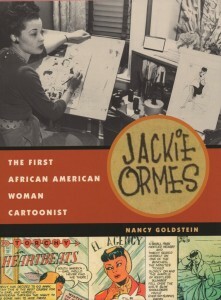 Zelda Jackson Ormes, better known as Jackie, was the first African American woman to make a living as a cartoonist. Between 1937 and 1955, her strips were syndicated extensively nationwide in the Black press, featuring Black women front and center in roles and social situations they were never accorded in the mainstream media of the day. In 1937 Ormes tried her hand at cartooning with her first strip, Torchy Brown in Dixie to Harlem. Through the heroine Torchy, a southern transplant to New York who became a performer at the Cotton Club, Ormes was able to address not only racism and prejudice, but also women’s careers and other issues she felt strongly about. She later described herself as “antiwar [and] anti-everything-that’s-smelly.” Although Torchy Brown initially appeared only in the Pittsburgh Courier, before long the strip was syndicated in 14 more Black papers across the country. In 1940 Ormes brought the original Torchy Brown to an end and briefly moved with her husband Earl to his small hometown of Salem, Ohio, but she was unhappy there, and they soon moved again to Chicago. 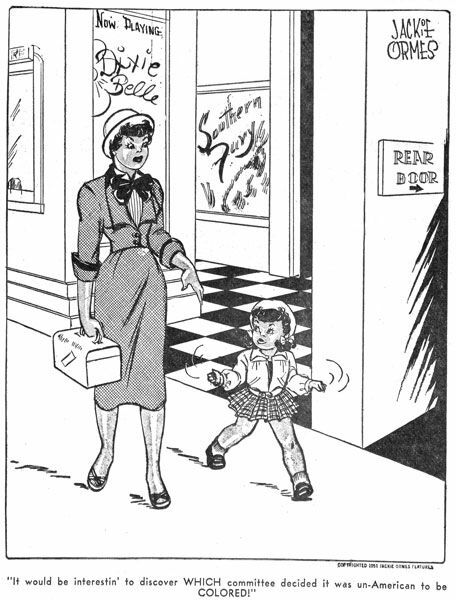 There, Ormes got a reporting job with the Chicago Defender, and by the mid-1940s she had conceived of another comic strip, the single-panel Candy. 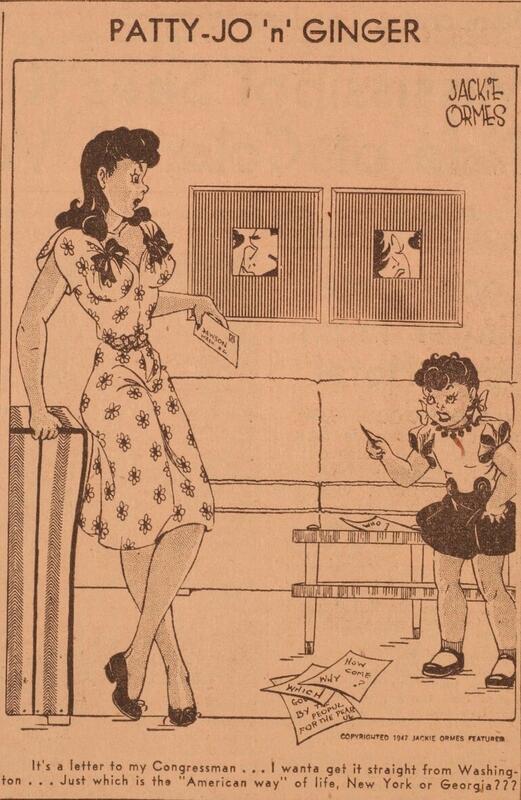 In 1946 she started another single-panel strip, Patty Jo ‘n’ Ginger, which featured the acerbic little girl Patty Jo and her fashion-plate older sister Ginger. Through the voice of Patty Jo, Ormes again commented on issues of the day, such as racism, sexism, the military-industrial complex, and McCarthyism. In 1948 she also licensed a Patty Jo doll, which was the first nationally distributed Black doll and remains a highly sought-after collector’s item to this day. 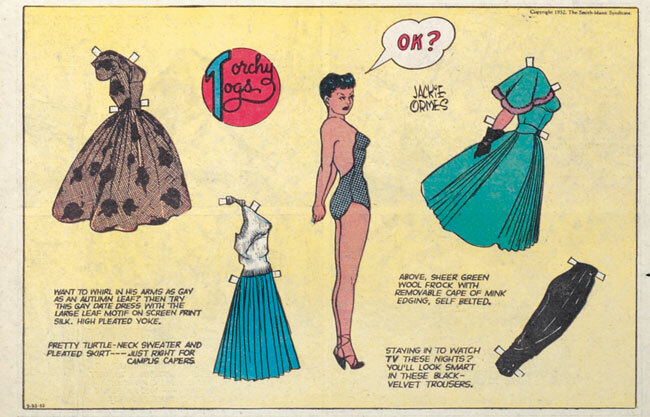 In 1950 a national syndicate persuaded Ormes to bring back Torchy Brown for a new strip, Torchy in Heartbeats. Initially, however, the syndicate only wanted her to provide the art to match a male writer’s storylines. This did not work out well, as Ormes said she constantly had to remind the writer that the character she created “was no moonstruck crybaby, and that she wouldn’t perish between heartbreaks. I have never liked dreamy little women who can’t hold their own.” Eventually, Ormes again gained full creative control over the strip, which ran until 1955, when papers like the Courier and the Defender cut their comics sections to give more space to news coverage of the growing Civil Rights Movement. Ormes switched to fine art painting until she also had to give that up due to rheumatoid arthritis. 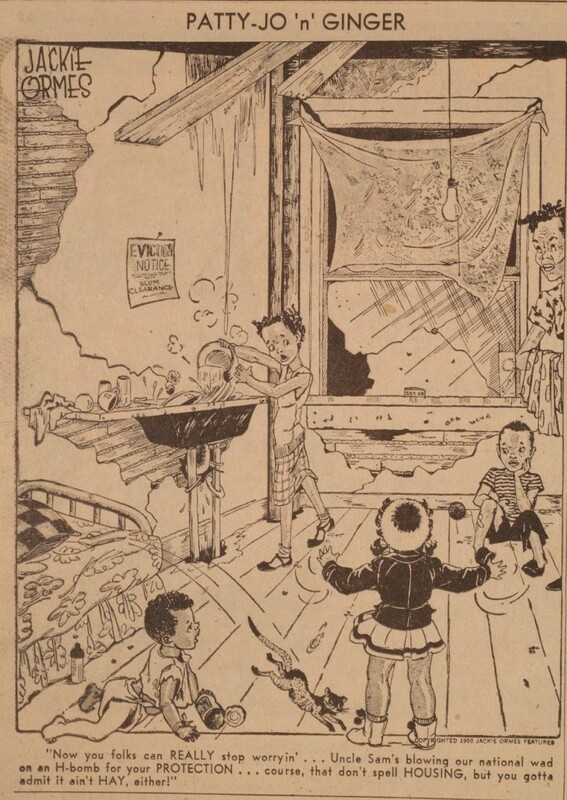 By the time Ormes retired from comics, her husband was managing the historic DuSable Hotel on Chicago’s South Side, hosting a veritable who’s who of Black performers, artists, and writers visiting the city. The couple formed lifelong friendships with celebrities including Lena Horne and Sarah Vaughan. Jackie also was heavily involved in local advocacy through the Chicago Urban League and the South Side Community Art Center. Here’s Ginger. She’s just graduated from college. I can do that, too. Here’s Torchy. She’s challenging the racism and the status quo of the era, and I can do that, too. And so she was giving voice to what was in the hearts and minds of so many people to move forward and make progress. 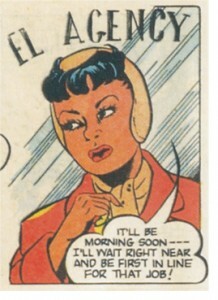 But while Ormes inspired confidence in Black women generally, her own industry remains virtually off-limits to them. From 1989 to 2005 there was exactly one nationally syndicated Black woman newspaper cartoonist, Where I’m Coming From creator Barbara Brandon-Croft — who credits Ormes as an inspiration from her own youth. Brandon-Croft ended the strip over a decade ago, and any potential successors have apparently been stifled not only by the familiar combination of racism and sexism, but also by syndicates’ heavy reliance on zombie strips. In 2018, Jackie Ormes was posthumously inducted into the Will Eisner Comics Hall of Fame, reigniting interest in the life and work of this brilliant comics pioneer. CBLDF Contributing Editor Maren Williams is a reference librarian who enjoys free speech and rescue dogs. Jackie Ormes was profiled in CBLDF Presents: She Changed Comics, along with a myriad of other women who established and influenced the comics industry that we know today. Get your copy here, or check out the free resources for using this work in the classroom. Please support CBLDF as we fight for all voices to be heard, and receive a signed copy of Jackie Ormes: The First African American Woman Cartoonist for your collection!